Aldi Novel Adilang was cut loose when a storm snapped the mooring on the simple wooden structure, known locally as a romdong, on 14 July. The 19-year-old worked as a lamp keeper on a floating fish trap around 77 miles offshore from his home on the Indonesian island of Sulawesi. Lighting lamps around the structure each night so that it would attract fish, he was suppled with food, water and fuel each week . With no engine or paddles, he was left at the mercy of the tides. He survived by catching fish, burning wood from his hut to cook them and drinking seawater through his clothes to minimise the salt intake. Each time he saw a ship, he waved frantically, but over 10 vessels passed him without spotting him. Eventually he was picked up on 31 August, thousands of miles from home in waters off the US territory of Guam, by the Panamanian-flagged vessel, MV Arpeggio, almost a-month-and-a-half after he was cut adrift. The ship's captain noticed the teenager's radio distress signal and turned the carrier around. Although the teenager was very weak and he fell into the sea when he jumped after a rope they had thrown to him. 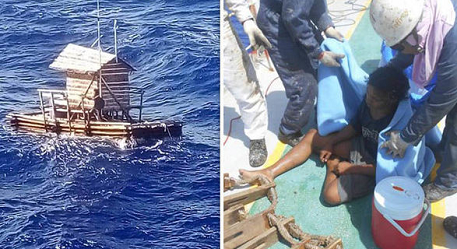 The ship's crew nonetheless managed to use it to rescue him, despite the waves around the trap being high.